On New Year’s Day 1947 Lord Mountbatten was summoned to Downing Street to discover his future role in history- to guide India to independence as the last Viceroy. Travelling from post-war Britain under rationing to the outsized splendour of Viceroy’s House in New Delhi, the Mountbattens leapt straight into their responsibilities. Gandhi, Nehru, Jinnah, Patel, Baldev Singh and a wealth of Maharajas all appear in this testament to the biggest challenge faced by a Viceroy- to break the deadlock that existed between the Indian politicians, to try to avert civil war and to achieve an honourable exit for the British. The result was the creation of India and Pakistan on 15th August 1947. Lord Mountbatten’s seventeen-year-old daughter, Pamela, was taken out of school to accompany her parents to India, and spent the next 15 months recording the birth of two nations alongside her own transition to adulthood. Beside her mother, Edwina, this young woman took on far more responsibility than would normally be required of a girl just finding her feet in the adult world. As an eye-witness, Pamela describes often harrowing scenes, colourful and exotic characters and major historic events, as well as wonderful recollections of her trips around India. 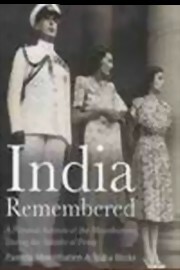 India Remembered is a pure evocation of this key period of India and Pakistan’s history. Using diary entries and extracts from the meticulously kept family photo albums as documentary evidence, this book is a brilliantly informative read and a chance to witness first hand a generation of characters whose actions were to change the fate of two nations.